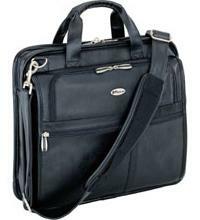 The Targus Leather Corporate Traveler offers you a luxurious leather notebook storage solution. With our patented SafePort Air Protection System (fits standard 15 inch notebooks), this case is perfect for the sales professional on the go and looking to make the right impression. Constructed in soft, durable textured leather, the Corporate Traveler's top-loading design makes it easy to get in and out of the notebook section- a must-have feature for those busy airport checkpoints. Other features include a hidden side mobile phone pocket, a unique shock-absorbing EqualizerStrap that evenly distributes the weight over your shoulder for greater comfort, and workstation with pockets for PDA, media, business cards, pens, pencils and more! Fits 15 inch size notebooks up to 13" x 2.0" x 11"